Another year, another The Bachelor. In fact, 2018 wasn’t even a day old before ABC sprung its newest terrible creation onto the world. And here he is, on January 1st, 2018 at 8pm - a bouncing baby boy. 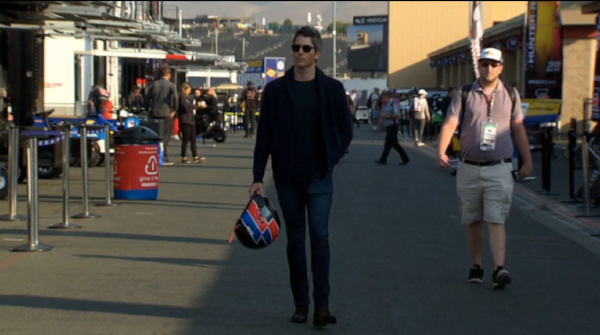 Arie kicks off the season with a journey down his harrowing past of attempting to find love, as extremely predictable footage rolls of him doing things in and around a race car. He says solemnly and somehow with a straight face: “This is the most important race of my life.” Ouch! Take that Firestone Indy Lights Series! We are magically transported to 5 YEARS AGO, a time when Arie had a much closer relationship with both a box of hair dye and with Emily....OR SO HE THOUGHT. At first it was all kissing and still more kissing, but pretty soon we're witnessing their relationship end in smoldering ruin. After all that fun, can you wait to do it again? It doesn’t matter, because it’s coming at you anyway! Also did you guys know that Arie races? He also sells real estate now, which sounds boring but a lot more suitable for him. Not hating. But just hating. Arie is visited by the ghosts of Bachelor contestants past, specifically Sean and Catherine, who have since produced an offspring. Sean tells him to "always treat the girls with respect," though, out of respect, I'm SURE he meant to say women. In short order (JK, everything around here takes forever), we are off to the races! eXXXtreme sports pun alert! Chris Harrison returns yet again because he’s unemployable in any other context. He goes on and on and on and on about what a great kisser Arie is. We have no time to consider how Chris Harrison knows this, because here come the women! First off is Chelsea, a single mom from Portland, Maine who spends most of her days as a sea dog, trawling the waves for lobster. Then there's Caroline, a realtor from Ft Lauderdale, who brags that she has sold 5 million dollars worth of real estate in just under a year. I mean, the average house price in Ft Lauderdale is $293,600 (source: Zillow). If we give her 11 months, that’s about 1.5 houses a month. I have no idea if that’s good for a real estate agent, but I’m sure you’re impressed with my math skills. Caroline also boasts about how she has so much in common with Arie because, in addition to selling real estate, she “grew up around cars.” Since the traditional mode of transportation in the United States is the automobile, I'm not sure this is as significant as she thinks it is. We next meet Maquel, a professional photographer who shoots weddings while seething with jealousy that she's not yet married. It's a fun dynamic. Next up is Nysha, who jumps out of airplanes and loves, I mean LOVES, fountains of blood. Tia is from Weiner, Arkansas, and this show handles that fact with all the class and dignity in the world. Kendall is a taxidermy enthusiast who communes with the other side through the medium of hokey ukulele songs. Bekah is a nanny with enviable hair of indeterminate age. Marikh believes in fate! Wow! We also have Krystal, a fitness coach who ironically sounds like she smokes 7 packs of cigarettes a day. She’s got a husky voice and likes to help the homeless community. Can’t get mad at that. During this intro, I’ve been steaming about one thing: Can you imagine a world in which ABC would hand over a show about romance and dating (and also fantasy suites) to a woman who had let her hair go grey? You can’t imagine it because it would NEVER happen. Women are not allowed to go grey and be considered dateable. They are relegated to the old crone corner of the table and have to play grandmas and witches and other cool and useful roles in society. Many women arrive, with varying levels of success. Chelsea, the single mom, has spent about 6 minutes onscreen, and at least 5 of them have been detailing what the other women are doing and how that’s NOT the thing they should be doing. According to her bio, her likes are: nothing, and her list of dislikes goes on for pages. These women are positively in a tizzy over Arie’s handsomeness. They all keep repeating “he is so good looking” over and over again, almost as if they’ve collectively agreed to enter into a group hypnotizing so that they may one day believe what they're saying. I mean, he’s fine looking. He’s not unattractive. If I saw him in a bar and someone said “people think that guy is cute,” I’d be like “sure, ok. Not my taste, but I could understand why.” But these ladies act as if he’s Ewan McGregor and Gael Garcia Bernal and Idris Elba all rolled into one. I hope you’ve enjoyed this short tour of my personal standards of male beauty! Arie remains equal parts charmed by the women, concerned about their nerves, and absolutely gobsmacked by their beauty. One woman really knocks it out of the part with the gift of a “gratitude rock.” I’d love to know what she did to piss off the producer responsible for doling out the welcome gifts. It must have been heinous. “That’s cute.” Ari lies as he grasps the worthless rock. Another main plot of the night is that there are a lot, and I mean a lot, of Laurens in this cast. By the time the dust settles and the champagne has gone flat, we’ll have met FOUR separate Laurens. Laurens represent a staggering 14% of the women there! The women are in their mid 20s to mid 30s, so this is indeed the time when many of these Laurens would be blossoming into marriageable age. “The race car jokes crack me up,” Ari says, after about the 13th iteration, and I don’t know him well enough to know if he’s being sincere. Tia, from Weiner, Arkansas (who is contractually obligated to be friends with the other Arkansas luminary, Raven) gives Arie a natural diamond from her homestate, the only diamond-producing state in the union! How cute is that? LOL, jk. She gave him a little plastic weiner. Another woman is a tanning specialist, so naturally she brings up the startling amount of genitalia she’s seen. “There's nothing like an icebreaker to talk about all the dicks you’ve seen.” One of the other women says in response to this tactic, and I genuinely crack up. There are more fun hi-jinks when a woman demands that Arie smell her armpits. Once he does so, reluctantly, she declares that this must have been the best pickup line he’s ever heard. She may be delusional, or she may know a lot more about Arie’s fetishes than we do. We have the rest of the season to find out! “Cool.” Ari says to basically every situation he’s presented with. They could replace him with a bobblehead programmed with just a few key phrases, and honestly would any of these women know the difference? They’re just looking for love. It could be with anyone who happens to be at the helm of one of the most popular television shows on TV! Maquel arrives in a race car, if only for the chance to take off her helmet and lustily shake out her locks. It's a dramatic gesture and it WERKS. “I kind of recognize the noise.” Ari says, as the car drives up. Honestly if anyone doubted that he’s a race car driver before, that really settled it. He knows what race cars SOUND like! People keep going on and on about how many Laurens there are, but there are about 100 blondes and everyone seems to think that it's normal. Do so many blondes exist in the world? According to the lightest of google research, about 1 in 20 Americans are blonde. Yet a full 13 of the women in this cast, nearly HALF, are blonde! What an incredibly rare occurrence! Chris Harrison comes by to discuss the little matter of the first impression rose. Suddenly, Arie becomes deadly serious. There’s work to be done. 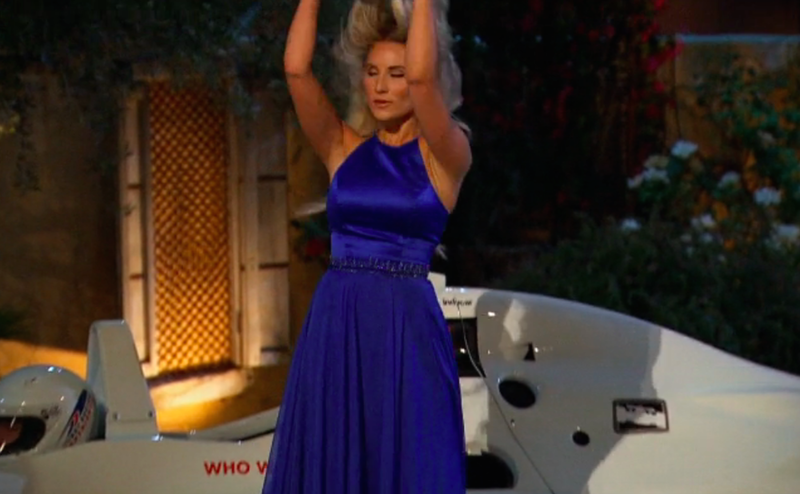 OF COURSE Chelsea steals Arie first. Classic villain move. I guess. That’s the narrative this show is pushing, anyway. But someone had to go first, right? How else would this go? They could all vote or decide by committee, but I’d wager that Bachelor Nation is not a democracy. It’s a benevolent dictatorship. By way of flirting, Chelsea goes on and on about the sacrifices she’s made to be on this show. “What sacrifice did you make to be here?” Arie asks. “Everyone makes a sacrifice to be here.” She counters. She clearly doesn’t have a tragic backstory to fall back on, though I’d argue that NOT having a tragic backstory is a tragic backstory in itself. She did just pass her real estate course, so she’s known her share of struggles. Arie talks about how he was a boy when he first came on, and now he’s a man. I check all available public records and discover that Arie is 36 years old. 36.Years.Old. That means he was 31 during his first jaunt into this franchise. Arie - you were a MAN. JESUS. Puberty does not end in your 30s, even if many men like to pretend it does. In nearly too perfect symbolism, Arie and Brittany T. race each other around the parking lot in toy cars. The male car (we know it’s for boys because it’s not pink) is about 10 times more powerful than the girl car, and thus Arie does significantly better than Brittany T. does. Because doi. All the advantage, these white men have. For her effort, Brittany T. is rewarded with a kiss. We are then rewarded with some vivid description of the texture of Arie’s lips. “His lips are like clouds. They’re like pillows.” What else are they like? Let’s continue down this metaphor track! Surely his lips are also like feathers. Or freshly fallen snow. Or a mattress topper. Or ice cream after you’ve let it to sit out for a few minutes. Also - have you ever tried to kiss a pillow? Not recommended. One woman makes Arie correctly identify the fruit he just ate, which was pineapple. It’s extremely impressive. Bekah (one of them, who knows which one) reads Arie questions posed by her mom. It’s always a good idea to include your parents on a first date, so I heartily applaud her choice. Chris Harrison then makes his dramatic appearance with the first impression rose. “Has anyone ever tried to bone him?” My boyfriend, a genius, asks. I would love that. Wasn’t there a season of The Real World in its messy early days where one of the cast-mates got involved with a producer? I won’t google it, but I’m fairly certain it happened. That sort of plot point would really only make this show better. A google search resulted in some shocking revelations! The first impression rose is lobbed into the crowd, sending the women scattering. Chelsea does the nearly unthinkable and steals a second heaping of Arie’s time. It’s incredibly disrespectful, extremely aggressive, and all sorts of other things the women say. This little maneuver might have gone over better if Chelsea hadn’t then immediately waltzed over and announced to the crowd that she just had her second course of alone time. This goes over about as well as you'd expect. On another note: Bekah looks just like Janine Turner. Remember Northern Exposure? Apparently Janine Turner is a rather extreme conservative and has some truly incredible views that few people have the guts to talk about. How disappointing. The point is - never google anything. Some other fraternization goes on, which all leads to the inevitable moment when Arie gives the First Impression rose to Chelsea. And if it creates drama, SO BE IT! I love how utterly uninterested in Arie these women already seem. THE NEXT DAY, the sun rises upon the rose ceremony. These women are exhausted, tipsy, and irritated. Let’s see what happens! Arie starts calling out the ladies who will be continuing on this race track we call love, or something dumb like that. He whittles it down to most of the women who got the majority of screen time this episode. How did he know?! Eerie. Chris Harrison returns to do what appears to be about 50% of his job - showing up to announce that there’s only one rose left (while this single rose is in full view of all the remaining women, for the record). Seriously. This is a man who makes 60k an episode. A large portion of that 60k was given to just show up and correctly point out the amount of roses in front of him. Literally a kindergartener could do his job. The women who were not picked are sad and teary, likely due to exhaustion after spending all week at a cocktail party. I hope they were paid a fair wage plus overtime. We get a sneak peak at exciting highlights from this season. Mostly there’s a lot of crying and exotic locales. Also, did they lose their entire transportation budget? 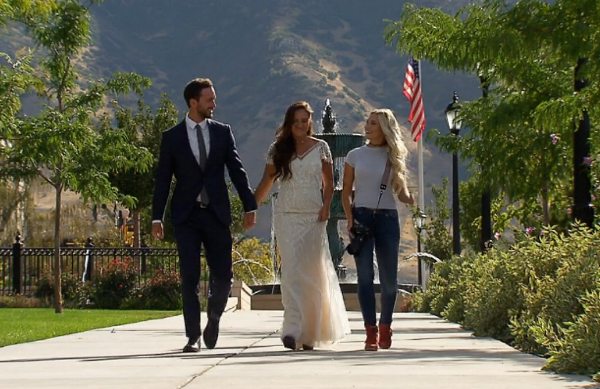 It looks like they made Arie walk to work literally every day. I’m left with a few questions, though: who is the mystery man that shows up to demand his girl back (just kidding, that Arkansas accent is a dead giveaway), what mysterious age is Bekah that it drives her to tears, and most importantly - how will people be able to assign blame when there are blonde hairs left in the shower? Tune in this season!